AAPS News June 2015 – Who Would Be The “Single Payer”? Some advocates of a “single-payer healthcare system,” notably Physicians for a National Health Program (PNHP), often begin with a scathing indictment of managed-care plans, including the complexities of dealing with dozens of them. (They know about these first-hand because they are enabling such plans by their participation.) We often find ourselves in agreement—until they get to their proposed solution. Other advocates of “universal” or “national” plans, such as the American College of Physicians (ACP), are not noted for criticizing managed care—either its business model or its major players such as UnitedHealthcare. Models to emulate are supposedly found in other industrialized (“civilized”) countries—ACP senior vice president Bob Doherty calls Canada “the real thing.” Or the American solution is Medicare for all—but generally not the Veterans Administration. A would-be model, the Green Mountain Care Board for administering Vermont’s planned single-payer system, was abandoned because of cost. It would have made Vermont the most highly taxed state by far. Democrat presidential candidate Bernie Sanders, a self-described socialist, could not explain to Fox News why his state’s plan failed. He simply repeated the line that other countries spend half as much as we do, and they guarantee everybody care (Forbes 4/20/15). In fact, in other countries patient-controlled (out-of-pocket) spending has clustered around 15%, about the same as in the U.S. But patient share in the U.S. has fallen by half in 20 years, putting us at the bottom of the pack. In Switzerland, patients control about a third of health spending. Medicare is not exactly a single payer either. The revenue may come through government, but disbursements are through private carriers: a public-private partnership. The Affordable Care Act (ACA) is also a public-private partnership—perhaps the epitome of crony capitalism, although it seems to be propelling us to a single-payer goal. The insurance industry had a duplicitous approach: “Insurers backed Obamacare, then undermined it. Now they’re profiting from it,” writes Wendell Porter. Only some are profiting. “All our local insurance companies are losing money due to ObamaCare,” writes Lawrence Huntoon, M.D., Ph.D., of New York. This includes Independent Health, BlueCross BlueShield of Western New York, and Univera Health (Buffalo News 4/1/15). But UnitedHealth Group posted first-quarter revenues of $36 billion, up 13% from Q1 of 2014. “Every part of the firm’s domestic business did better than expected: Medicare, Medicaid, employer-based benefits and Obamacare exchanges,” writes John R. Graham. The health plans’ mastery of ObamaCare is “the real obstacle to advancing an alternative” (Forbes 4/15/15). What Will the Single Payer Pay For? What it probably will not pay is a fee for service. “There is increasing evidence…that fee-for-service, like a play gone stale that has been on Broadway way too long, is about to end its half-century run,” writes Doherty on the PNHP blog. Congress, in passing the Medicare Access and CHIP Reauthorization Act (MACRA, H.R. 2) has now agreed with AMA, ACP, AOA, and numerous other medical organizations on transitioning to a different payment model. This model shifts risks to physicians. Private doctors cannot afford to participate, writes Stanley Feld, M.D. “Obamacare’s basic theme is built on hospital ownership of physicians’ practices” because of the complex information technology IT infrastructure required. IT is needed for what Donald Berwick, M.D., et al. call “Change from the Inside Out: Health Care Leaders Taking the Helm” (JAMA 5/5/15). ACA is not just about coverage, but about changing the way “health care” is delivered. The goal is the “Triple Aim”: better care for individuals, better health for populations, and lower per-capita costs [spending]. Also, “professionalism,” which includes the obligation to promote social justice, needs to be enhanced through management, writes Ezekiel Emanuel, M.D., Ph.D. (JAMA 5/12/15). A “love affair with quantitative methods has rapidly taken over the medical field,” writes Michel Accad, M.D. This requires turning away from “anecdotal” individual clinical interactions to population medicine. Prescribing for “risk factors” and “determinants of health” means that patients are treated like numbers, quite literally. Population medicine, which reigns at the Institute of Medicine, is the analog of neo-Keynesianism, which reigns at the Federal Reserve. Emanuel has written over and over again of his “love” for Optum, part of the UnitedHealth Group empire, states Barbara Duck. 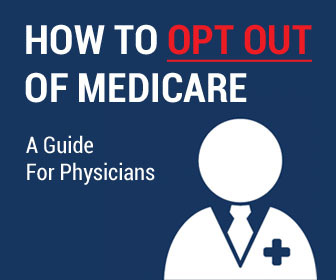 Medicare director Andy Slavitt is a former Optum executive and Goldman Sachs banker. Will UnitedHealth Group be the single payer/central planner? Ingenix. The company responsible for the software that was the subject of an AMA lawsuit concerning the low-balling of physicians’ out-of-network fees for 15 years is now OptumInsights. Hospital Revenue Cycling. Mayo and Dignity recently contracted with United. Usually such contracts involve firing hospital employees and rehiring them at lesser pay and fewer benefits. Urgent Care. Optum bought MedExpress, which owns 141 full-service clinics in 11 states. 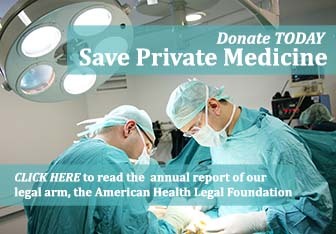 It advertises that it wants to buy physicians’ practices. It has additional urgent care centers in Texas and other states under its own branding. Pharmacy Benefits Manager. UnitedHealth Group bought Catamaran PBM, just as it got hit with a class-action lawsuit for low-balling pharmacy reimbursements. United could profit not only from selling drugs but from selling the huge amount of data available from prescriptions. Optum grabs and analyzes data and sells it to entities like IMS, the biggest seller of healthcare information out there. Clinics and patients need a PBM: it could be a great way for subsidiaries to work together. Electronic Health Records. United’s OptumInsight subsidiary wants to be your consultant service for Allscripts, Epic, and GE Centricity, starting with implementation (Duck, op. cit.). And More… Business intelligence killer algorithms fire thousands of doctors caring for Medicare Advantage patients. The Optum PM EHR has practice management built in. A consulting firm, CanReg, helps get FDA approval for drugs and devices. A daisy chain of subsidiaries can apparently handle a product from first submission to depositing the proceeds in one of its banks. Optum360 is expert in ICD10 readiness [and may be hurt by implementation delays]. UnitedHealth Group bought QSSI, which was awarded the federal data hub contract; Humedica, the “premier clinical intelligence partner to health care”; and 51% of SimonMed medical imaging (http://tinyurl.com/mqjegxd). “What does it mean if your doctor, clinic and insurer have joined camps?” asks Twila Brase, R.N. ObamaCare developed Accountable Care Organizations (ACOs) to facilitate—indeed, embed—a divisive consolidation of hospitals, doctors, government, and insurers to ration care, starting with Medicare. She points out that the patient who has paid thousands of dollars to a third-party payer has fewer resources to buy needed care if the insurer-employed doctor withholds that care. The number of ACOs has grown from 64 in Q1 2011 to 744 in Q1 2015. Gorbachev is riding in a limousine through the countryside and sees a ploughman walking behind a horse-drawn plough. Health Information Blocking. Americans don’t own their health information. “You can’t force a covered entity to give your data to someone you choose, and you can’t stop them from giving it to someone they choose,” writes David Brailer, former national health information technology coordinator in HHS. “Whoever controls health information will dominate the health-care marketplace and its vast profit pool” (Wall St J 5/1/15). Spear Phishing. A single hacked medical record can be sold for $70, cf. less than $1 for a credit card. Allowing employees to use their personal unsecured devices is one threat. Ostensibly legitimate e-mails may contain web links that deliver malware with the goal of exfiltrating data (BNA’s HCFR 4/29/15). Ransomware. Clicking on an e-mail from what appears to be a known sender can introduce a virus that encrypts data on the computer, and a demand to pay for decoding it. There were an estimated 8.8 million attacks in 2014, up from 4.1 million in 2013. Some victims pay the relatively small ransom. An expert may be able to decipher your data. Update your antivirus software up, do frequent backups, and store them offline (MPCA 5/11/2015). Dangerous EHRs. A litigation expert said that Congress may need to create an injury compensation fund for EHRs, similar to the Vaccine Injury Compensation Fund. “Like the car industry…in 1965, we’re making gigantic, horrendous, unsafe machines with no seat belts, and they are selling like hotcakes. But there is no Ralph Nader” (Politico 5/4/15). One of only two states with an EHR mandate, Minnesota passed a hard-fought exemption for solo practitioners and cash-only practices of any size (http://tinyurl.com/m7ym2cc). Jun 6, 2015. Board of Directors meeting, Raleigh-Durham, NC. 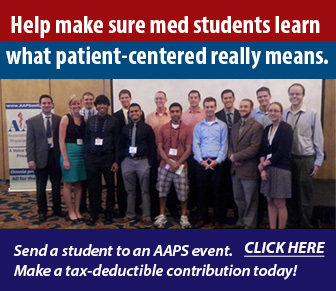 Help us bring students to our annual meeting by making a tax-deductible donation to the AAPS Educational Foundation at http://aapsonline.org/scholarships — or invite a student. The Obama Administration wants to control states’ policy through subsidies and to circumvent the NFIB decision that states cannot be forced to expand Medicaid. While the federal government cannot cancel all Medicaid funding, Obama is threatening to withhold $1 billion due to Florida under a waiver approved in 2005, and to cancel a five-year $29 billion Medicaid waiver program approved in 2011 for Texas, if the states do not accept the Medicaid expansion. The scheme is called “cooperative federalism.” Florida governor Rick Scott is suing the federal government, and Texas governor Greg Abbott and Kansas governor Sam Brownback are joining the suit. “This example represents another trick play…in order to control and limit states’ rights,” states Stanley Feld, M.D. Unauthorized Spending. Cost-sharing subsidies to insurers were never authorized in annual appropriations. The Treasury Dept. rebuffed a request by House Ways and Means Committee Chairman Paul Ryan to explain $3 billion paid to insurers anyway. Rep. Peter Roskam (R-IL), chairman of a Ways and Means oversight subcommittee, is calling for an ObamaCare watchdog to audit some eight agencies that have disbursed tens of billions of dollars in ways conflicting with the statute (Forbes 5/21/15). Unauthorized Tax Subsidies. Beyond the controversy in King v. Burwell, the IRS has also expanded eligibility for subsidies to low-income illegal aliens and to people below the clear income cutoff of 100% of poverty. Both can trigger substantial penalties for employers (Wash Post 4/14/15). Bribes to Congress. To keep Congress from re-opening ACA to fix problems—such as the provision that required Congress members and staffers to get their health coverage through Exchanges without the $10,000 employer contribution—the Administration simply ignores it and pays $10,000 subsidies. David Vitter (R-LA), chairman of the Senate Small Business & Entrepreneurship Committee, has been trying to subpoena documents relating to claims that Congress is a small business. He was blocked when five committee Republicans (including Rand Paul) voted with all nine Democrats to quash him (Forbes 4/23/15). In searching for evidence of kickback schemes, prosecutors are employing tactics formerly reserved for narcotics and other RICO cases (and physicians). It “flipped” two high-level executives at Sacred Heart Hospital in Chicago, who secretly pleaded guilty and wore wires in an effort to incriminate others. Cooperators are told ahead of time about gaps in the government’s case and what they need to get the target to say on tape. Six defendants were then arrested at work and led out in handcuffs instead of being allowed to surrender voluntarily, as is generally done in white-collar cases. Former CEO Edward Novak was convicted in a six-week jury trial, as were COO Clarence Nagelvoort and CFO Roy Payawal (BNA’s Health Care Fraud Report 4/15/15). Tip of the Month: The Interstate Medical Licensure Compact defines a “physician” as someone who is compliant with MOC (or exempt based on grandfathering). This new state law grants special authority to a new interstate commission to regulate the practice of medicine with almost no accountability. We helped defeat this legislation in Texas, but it passed in eight smaller states: Alabama, Idaho, Minnesota, Montana, South Dakota, Utah, West Virginia, and Wyoming. Once the interstate commission is established, physicians in these states who are MOC-compliant can seek expedited licensure in another one of these states. But beware this approach, because a revocation or suspension of a medical license in one state will result in automatic revocation or suspension in all the other states. And the interstate commission will not be subject to the courts of your state, but only to courts located in Washington, D.C., and where the commission itself is located. AAPS is considering challenging the legality of this power grab. The most dangerous place for a black American is the womb, said Ryan Romberger of the Radiance Foundation, pointing out that more than 40% of black babies are aborted. To help draw attention to the complicity of advocacy organizations in the abortion industry’s agenda, Romberger wrote an article entitled “NAACP: National Association for the Abortion of Colored People”—and was sued for alleged trademark violation. A federal judge banned Romberger from even mentioning the parodied name. With the help of the Alliance Defending Freedom, Romberger appealed to the Fourth Circuit Court of Appeals, which held 3 to 0 that “trademarks do not give their holders under the rubric of dilution the rights to stymie criticism. Criticism of large and powerful entities in particular is vital to the democratic function” (http://tinyurl.com/meny5a3). Physician Michael Fitzgibbons, M.D., was awarded $5.2 million by a jury in compensation for distress he experienced because a hospital CEO had a loaded firearm planted in his car, occasioning his arrest, and had a tire slashed on his car, causing a serious accident while his daughter was driving on the freeway. Dr. Fitzgibbons had opposed actions taken by Integrated Healthcare Holdings, Inc., on the grounds that he believed they would jeopardize patient safety. The trial court then overturned the jury’s verdict, based on the argument that the hospital should not be held liable for its CEO’s conduct. “The hiring of a thug was a ‘startling and unusual…occurrence.’” In an unpublished opinion, the Court of Appeals of the State of California, Fourth Appellate District, Division Three, reinstated the verdict on April 30, 2015. “[Dr. Fitzgibbons’s] story shows how far some hospital administrators will take retaliation against a physician whistleblower,” writes Lawrence R, Huntoon, M.D., Ph.D. The shocking details show “the tremendous power of hospital cartels, and the ruthlessness they may display in retaliating against a physician who opposes them or exposes their wrongdoing” (J Am Phys Surg, summer 2013). Government Accuracy Rate: 4%. A 2004 study showed that Medicare “customer service” representatives get it wrong 96% of the time. Now, an FBI internal review finds that its forensic hair analysis was wrong 96% of the time. The FBI also trained state and local law enforcement how to do hair analysis (in a 2-week course), and taught them how to testify so as to secure a conviction. Fourteen people, who were convicted based on hair-analysis evidence, have since been executed. Legal experts anticipate hundreds or thousands of convictions, based on hair analysis, may be appealed (Buffalo News 5/15/15). Is the target of getting it wrong 96% of the time part of a government effort to implement MOI (maintenance of incompetence)? Get Involved in Organized Medicine. 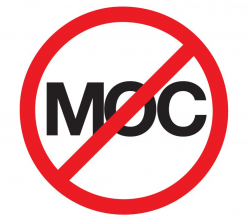 At the Michigan State Medical Society, anti-MOC resolutions have had only two opponents in 3 years, a board member and residency director, neither doing MOC themselves, so no one took them seriously. Our progress has been calculated and effective. This isn’t to say organized medicine isn’t painful. While good resolutions pass, so do crazy nanny things. You have to watch kindly fascists argue resolutions to ban discussing politics with patients or ban concierge medicine. Mostly, such doctors are older and have been pulling tricks at the House of Delegates for decades. Once a young (under 60) new voice shows up, it’s amazing how many other doctors start getting a spine and speaking up too. Find a colleague who has a sense of humor and will go for drinks with you and laugh at the nonsense, call up your county medical society and ask to get involved as an alternate delegate, or sit on a local legislative committee. If there is no active society, you can appoint yourself as the delegate. “Professionalism.” In an article on “Enhancing Professionalism through Management” (JAMA 5/12/15), Zeke Emanuel writes “many, if not most, physicians are probably in the top 1%.” He lives in Fantasyland. The only MDs who earn at the top 1% of U.S. income are the ones running the ABIM cartel. I see my colleagues going out of business in surgical specialties due to lack of demand. For the last 10 years all the new young MDs showing up are all employees of the hospitals or smaller MD groups; they come and go like department store employees. So many of my colleagues cower in fear of the hospital CEO or an insurance plan. There is so much fake speech in U.S. medical journals now that it is hard to recognize truth! Interstate Medical Licensure Compact. FSMB’s IMLC, now enacted in 9 states, defines a physician as someone who “holds specialty certification” and therefore has had to pay into the scheme exposed by Kurt Eichenwald in his article on the financial status of ABIM (American Board of Internal Medicine) (Newsweek 5/21/15). I will be introducing a resolution to the Florida Medical Association in July, which will either specifically allow alternate boards to be recognized (such as the National Board of Physicians and Surgeons, NBPAS) or oppose the compact entirely. It will also require that states maintain an independent licensing option, separate from any multi-state license. Pay Up, or Else… If the American Osteopathic Association or a board revokes your certification (which should be lifelong) for nonpayment of fees, you would apparently not be able to participate in American Health/Independence Blue Cross. That could have a dire effect on the livelihood of physicians who participate. Baltimore’s Broken Windows. The theories of Lord Keynes predict that Baltimore, now that many businesses are in ruins, is on the verge of a comeback that will end poverty, based on the concept of “stimulating aggregate demand.” Keynes himself once said that a depressed economy could be stimulated by the government burying bottles filled with money in coal mines filled with garbage. Frédéric Bastiat called this the “broken window fallacy.” This may explain why the “War on Poverty” has cost the U.S. taxpayer $22 trillion and has thus far not only failed to eliminate poverty but has arguably made the problems much worse (Transom 4/28/15). The HR2 (MACRA) Surrender. HR 2 surrenders control of our profession to bureaucrats and cronies. It surrenders anything we built for the good of our patients so that we can be “spared” from the SGR threat. Having non-physicians judge us, rate us, make our decisions, and decide whether or not to pay us is the equivalent of non-pilot FAA administrators or non-trained Congressmen pilots placing themselves into the cockpits of military combat aircraft or commercial aircraft with an arrogant sense of false confidence that they can do it better than trained pilots. We have expected organized medicine to be our wingman on our mission, but except for AAPS our organizations seem to agree with Obama that “we didn’t build it.” FMA told me it doesn’t represent individual doctors.